This 24 ply tough counterboard is tough for long runs. Relatively easy to cut, it is used primarily as the base for most counters. Usually 2 pieces are glued together prior to cutting through 1-1/2 layers. .072″ (1.8mm) thick; sheet size 14″ x 22″ (36cm x 56cm). Thin, extremely hard board customarily used as an overlay for one of our other counterboards. Thin Gray Fiber Board holds up well and reduces the need for sanding the counter as it does not emboss easily. Also used as the base board for flat foil counters and as the base for composite counters in conjunction with combination foil dies. .030″ (.75mm) thick; sheet size 14″ x 22″ (36cm x 56cm). The thickest and toughest of all the counterboards that we offer. Because of its superior durability it is normally used as a counter base. As an overlay, it leaves the least amount of bruise when properly taper cut. .080″ (2mm) thick; sheet size 14-1/2″ x 22″ (37cm x 56cm). Feedboard, with a cutout slightly larger than the die, is fastened to the center feed table so that stock being stamped can be held above the die and protected from ink marks and splashes. .036″ (.9mm) thick, 10 ply, 22″ x 28″ sheet (56cm x 72cm). Perfect for cutting all types of counterboard. A thin, replaceable 4-1/2″ blade slips into the self-locking, adjustable wooden handle. The blade can be sharpened on an oilstone or with emery cloth and then replaced in the handle. Handles sold individually. Blades sold individually or by the dozen. May be used to make a counter for hot blind embossing or hot foil stamping. The kit consists of a powder and a liquid which, when mixed according to simple directions, will harden to reproduce even the finest details. It gives a quick, inexpensive custom counter every time. When photoengraving, film can be used with this photopolymer material to create a perfect, reusable photocounter for even the most intricate plates. Eliminates hand cutting and thereby greatly decreases make ready time. Two types are available. Sheets are sold individually. Steel-Backed Photo Counterboard sheet measures 11-3/4″ x 16-1/2″. Clear-Backed Photo Counterboard sheet measures 16-1/2″ x 23-3/8″. .031″ thick, plastic-coated material used as a counter overlay when die stamping bold images. Its texture will allow you to emboss into the boldest lettering. Tough enough to hold up for many thousands of impressions. 54″ wide. Sold by the linear yard. A thin, soft fabric, used as a counter overlay. Its tacky rubber coating helps lift stock out of the die after an impression has been made. Generally used when running business cards by hand—the cards lift up with the ram making it easier to pick them off the ram, rather than off of the feedboard. 36″ wide. Sold by the linear yard. Teflon Coated Drawsheet is generally used as a counter overlay. It is ideal when running large dies that cause the stock to stick to the counter. It also helps release the stock from the counter when running metallic inks where the ink’s binder is pushed through the paper. 37-1/2″ wide. Sold by the linear yard. Acts as a cushion between the wiping pad and the die. It is clamped tightly on the wiping pad, covering the cork pad. Our press blanket is made of a tightly woven, springy, heavy pure wool material which unlike felt is resilient enough to permit repetitive die width changes without grooving. 1/8″ thick. 36″ wide. Sold by the linear yard or by the square inch when cut to specific sizes. This overlay protects the press blanket from dirt and abrasion when the die wipe paper breaks. The tough fabric has a synthetic rubber coating impregnated with microscopic glass beads. 42″ wide. Sold by the linear yard or square inch, precut to size to fit your press. Composed of compressed, fine-grained tightly bonded cork particles. Mounts between the wiping plate and press blanket to provide added cushion for a clean wipe. Sold in sheets, 24-1/2″ x 36″ x 1/4″, or precut to size to fit your press. Megill’s Gauge Pins are used to position the stock when hand feeding. Their very low profile does not interfere with feeding as do other pins and quads. These pins have a tongue which is adjustable in length to suit all situations. Three prongs hold the pin to the feedboard. The sharp center prong is pushed through the feedboard 1/4″ behind the feedline. Two teeth on the other end should be forced down after registration is obtained. Some operators also glue the pins in position with sealing wax. Extra tongues and directions included. Sold by the box holding 12 pieces. Adjustable quads are held in place by a locking lever that is raised and lowered to squeeze the feedboard. For each Quad Guide, make one or two slits of about 1” in length between ¼” and ¾” from and parallel to the feedline. Slide the guide under the slit at the front into register position. After adjusting for register, lock the guide into place by lowering the lever. Three extra tongues and instructions included. Sold in sets if three with three additional tongues. Rectangular pieces of hardened steel, 1/4″ x 1/4″ x 1/2″, used as gauges for hand feeding. Quads are usually glued down with a white glue and are temporarily set until the exact gauge is achieved, and then pushed down firmly. Sold in a set of three pieces. This flexible, stainless steel ruler is used to accurately check the gauge from the edge of the paper to the stamped impression. Has 1/32″ and 1/64″ gradations. The crossbar on the pocket clip serves as a depth or height gauge. Permits fast and easy gauge changes, reducing time and effort compared to conventional methods. The gaugeboard screws down onto the original wooden center feedboard, and is fitted with adjustable gauges. Locking screws quickly secure the gauges in position. A cutout finger hole permits the press operator to remove the stock easily after stamping. This metal board saves money by eliminating feedboard costs. Gaugeboard comes with 3 sets of gauges and posts, and installation and operating instructions. Adheres layers of counterboard together and the counter to the counterblock slide. Dry adhesive is applied like a big crayon and creates its best bond after pressure has been applied. It can be pulled apart or separated when heat is applied, which is handy for “patching” an impression or for removal from the slide. Most of the strength of a counter made with Prout’s Glue is horizontal to the press’s force. The counter will not slip sideways. No “drying” time is required and a counter can be cut immediately after being glued. 1/2 lb. foil wrapped sticks; sold individually or by the dozen. Double coated or Double faced tape is available in three widths – 1″, 2″, and 4″. It is perfect to securely attaching thin metal plates to a plateholder. It can also be used to attach counterboard or photopolymer counters onto counterblock slides. 36 yard rolls are sold individually. A stick wax used to fasten gauges (quads, pins, etc.,) into place. Use a match to melt a few drops onto the gauge which has been placed in position. The sealing wax is quick drying and tough. 1/2″ by 1/2″ by 10-1/2″, sticks are sold individually or by the 1 lb. box of 4. High Heat Double Coated Tape is a wonderful substitute for thermal bonding tape. It will hold embossing or foil diesto a hot plate, but unlike thermal bonding tape it can be applied and removed at room or operational temperature. High Heat Double Coated Tape is very aggressive to 425° F (220° C). Ideal for holding 18 gauge or 16 gauge plates at the proper height in the die chuck. Plates may be mounted to the plateholder with glue or double faced tape. The regular plateholders are usually supplied with a single rear rail, but additional rails may be added on the sides. Please specify the exact size of the plate when ordering the plateholder. This is an aluminum plateholder with magnetic inserts which efficiently secures the plate without glue or double coated tape. The plateholder is furnished with 3 rails to keep the plate aligned. Excellent for holding steel business card or envelope plates. After an impression has been stamped in metallic ink, Burnishing Tinsel may be used, on the second pass to enhance the detail in the die’s bottom. Burnishing the impression gives good detail and prevents tarnishing of some inks. 6″ wide and .002″ thick. 3-1/4 lb. roll (about 70’ long). .0014″ x 6″ wide x 100’ long roll weighing approximately 3.3 lbs. It is 30% thinner than the standard material so as to smooth over finer lines. Used to scrub dried ink from the fine lines of a die or plate. The fine brass bristles will not scratch copper plates, but are stiff enough to remove dried ink. Two styles are available, both are mounted in wood: one measures 1″ x 3″; the other is 3/4″ x 3″ with a 5″ handle. Steel Ink Knife – 3″ wide by 8″ long, this stiff high carbon steel blade has been hardened and polished. 3″ wide blade. One solid piece of molded nylon for extra durability. The knife will not scratch ink rollers, but at 14″ long will hold a large amount of ink. Easy to clean. This knitted cotton tubing permits more ink to be carried when placed over a rubber inking roller. It also forces ink to the bottom of the etched cavity. If the etched lines are extremely deep, two or three layers may be used. Two types are available. 25 yard rolls; available in various diameters: 2″ to 2-1/8″, 2-1/4″, 3″, and 4″. The 4″ is available only in Plain style. Plain Stockinette, which will carry a little less ink to the die than Moleton Stockinette. Moleton Stockinette is a fleeced plain stockinette, but with a “nap” or “fuzz”. Inexpensive blue-colored solution provides a quick, reliable means of detecting worn chrome plating on steel dies. A worn area will quickly change to a copper color. Some operators perform this test every few thousand impressions so they can strip and re-plate their dies and plates as soon as the plating shows wear. Using this method, the life of a die may be prolonged indefinitely. 8 oz. bottle. A very aggressive cleaner which will dissolve dried and hardened ink which was previously “impossible” to remove. Blast Away will also clean dirt from dies, fountains, presses, and floors. It must be thinned with at least 3 parts of water to be used at its greatest strength. Environmentally clean, biodegradable, and very strong. Should be mixed and may be transferred to a spray bottle. Transfers ink from the large fountain roller to the die. 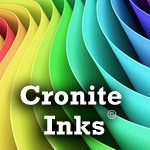 Cronite offers ink rollers made from Urethane. Urethane ink rollers are available in 2-1/4″ diameter and they have a 5/8″ diameter hollow steel core. The rollers are sold by the inch, up to 21″ maximum length of an uncut roller. The rubber ends also can be cut back to expose the steel core around which stockinette can be attached. A textured ink roller which eliminates the need for stockinette on most jobs. The tiny pockets created by the texturing on the roller bring a large quantity of ink to the plate when needed. As no stockinette is needed, there is no need to expose the core on the Diamond Textured Ink Roller. This product will save you money by shortening press set up time. The normal width used is 1/2″ wide. One collar is placed on each side of a narrow inking roller to center it over the die. Also, makes it easier to attach stockinette when needed. The collars are also available in 5/16″ widths as a Carver part. The seals are a good way to advertise the special nature of the engraving process. The 3/4″ diameter seals make any package of engraved stationery “stand out”, as well as taping the ends down. The seals are silver and black foil with pressure-sensitive glue. Sold 1,000 seals per package. For foreign sales only. Available in 30#, 35#, and 40#, with sizes of 2-1/2″ through 12″. Sold by the pound. This cloth is primarily used on steel. The abrasive will last a long time since it does not clog quickly or wear away. The Bauxite cloth is offered in grit values of 500, 400, 320, 240, and 150. Grit 320 polishes well without scratching too deeply, and at the same time does considerable cutting. Sheet size 9″ x 11″. Sold individually or by the dozen. A natural novaculite stone used to produce the most precise edge possible. The oil stone is used for sharpening gravers and counterknives. The stone should be used with a light oil to help prevent clogging the stone’s pores. Measures 2″ x 5″ x 3/4″ thick. Mounted in a hardwood case. An instrument that determines the exact depth of an etched or engraved area. The indicator has an adjustable dial for easy calibration. Easy-to-read 2″ diameter dial has .0005″ calibrations, with enough space between each calibration so the user can further interpolate his reading. The body is chrome plated. Each indicator is sold with a spare point and precision ground steel block used to zero the gauge accurately. The Dial Depth Indicator is an inexpensive mechanical instrument that can only be replaced by an electronic microscope costing thousands of dollars. High quality, 3-1/2 power, engraver’s magnifying glass set in a 2-1/8″ diameter hard plastic casing. The lens is distortion-free and built for durability. It can be used in Cronite’s Engraver’s Glass Stand with optional adapter. Built to last a lifetime, our all-metal stand is fully adjustable by turning just one small knurled knob. The heavily weighted base helps prevent tipping. After protective greases are removed from dies or plates with a product such as kerosene or varsol, Wood Alcohol is used for final cleaning. Cronite’s “commercially pure” Wood Alcohol will leave your dies clean and free of any residues which could contaminate the surface to which the etching ground (acid resist) is to be applied. Usually, the alcohol is rubbed on with a lint-free clean cloth. It is allowed to evaporate, taking with it any petroleum residues. Bottled in a plastic container for shipping, the alcohol can evaporate through the container, and can also absorb water from the atmosphere. Although the level in the bottle may not diminish, the potency of this product may decrease. If it is to be stored for a prolonged period, transfer to a glass bottle. Flammable liquid. A thick paste used to coat and protect bare metals such as steel and copper from oxidizing during shipping and storage. The compound contains no acids or caustics that will attack metals, as does Vaseline or other greases. Easy to apply—just smear a thin coating on the surface. To remove, wash off with petroleum solvent. 2 lb. can. Written by R.N. Steffens, this book is still the best reference text for engravers. It contains information on presses, etching, tools, equipment, methods, and supplies. It is used by everyone in the industry, regularly. Illustrated and hard bound, 332 pages. Photocopied chapters are also available for sale. A 23-page engraved booklet filled with over 330 of the most commonly used lettering styles available on Masterplates for Pantograph use. This is a necessary reference for all engraving departments, as well as for salesmen displaying styles to customers. A comprehensive training guide for the engraved stationery die stamping trade which describes the process so that even a beginner can understand. The guide presents an efficient, safe method for hand feeding Carver, Modern, and Waite die stamping presses. It also describes procedures for engraving copper, brass, zinc, and steel plates. Everyone should read it. We give a copy with each new press sold. 34 pages, illustrated. This book is a complete guide to crest designs, their composition, and commonly used crest lettering styles. Authored by J.M. Bergling and A. Tuston Hay, it is written in an interesting and concise style. 92 pages with over 2,000 illustrations and a complete dictionary of heraldic terms. An encyclopedia of monograms and monogram lettering styles by J.M. Bergling and V.C. Bergling. This simple book is a must have for engravers, designers, and all lovers of art. 110 fully illustrated pages, flexible cover. All Parts Booklets include illustrations and Part Numbers. Detailed training aid covers the procedures for the proper operation of the Cronite 5 x 9 Press, equipped with a High Speed 8000 Autofeed and Telestacker Drier. The video or DVD contains valuable information for all die stamping press operators. VHS video cassette. Approximately 2-1/2 hours. Fast-drying, dark liquid acid resist for all metals. When applied properly, one can easily see through it to the metal surface. It can be used in an etching machine because the surface is tough and won’t rub off or chip. Janes Ground is usually poured on the metal directly from the can. Then the metal is tipped in all directions until the area to be etched is fully covered. Excess ground may be poured back into the can from the corner of the metal plate. If necessary, thin with Ether. The ground may be removed with Wood Alcohol. Flammable liquid. 15 oz. can. An acid resist that will dry hard and fast, and easily “chip off”. If applied properly, it will not foulbite. Bob’s Chip Out Ground is good for all metals. It can be used in hand etching with an acid brush, or in an etching machine. Flammable. 8 oz. can. A premium acid resist that will dry hard quickly, and “chip off” cleanly and sharply. If properly applied, it will not permit foulbiting. It is good for all metals. 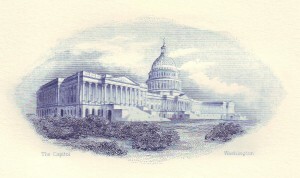 Freelance can be used in hand etching with an acid brush, or in an etching machine. Flammable. 8 oz. can. This red liquid is used to make any necessary corrections to the traced or scratched image on the ground covered die prior to etching. Stop Out Wax should be applied with a good red sable Stop Out Brush. Thin it with a small amount of quality alcohol. After etching, the Stop Out Wax can be removed with alcohol, along with the mechanical acid resist. Flammable. 4 oz. bottle. A pure (no fillers) material used by engravers to make Stop Out Wax. To prepare the wax, dissolve a broken stick or two in denatured wood alcohol. Apply the slow-drying solution with a Stop Out Brush to areas not requiring etching. Sticks are approximately 1/2″ x 1/2″ x 9″ long. Sold individually or by the 1 lb. box of 10 sticks. A corrosive acid resist which flows smoothly, dries fast, and requires no burning in. It is compatible with most coatings. Flammable liquid. Used to remove Retouching Varnish without damaging the original Conta resist. Flammable liquid. Bank Coat Asphalt Resist – An asphalt-base, thick fluid mainly used as a fine paint for delicate and close work on items that need protection from the environment, acids, or caustics. It is inexpensive and usually used on large banknote plates. Top quality, 100% red sable hair. Used to apply Stop Out Wax or Touch-Up Lacquer. Stocked in 4 sizes (00, 0, 1, 2), which will accommodate your every need. Number 00 is for fine work; number 2 can easily cover a large area. Keep one of each size on hand. A light blue corrosive liquid with a nitric acid base that effectively etches steel and brass. It is specifically formulated for hand etching with an acid brush. This is the best steel acid in the world, used in many other industries from gun and knife engraving to chemical milling of large dies and molds. The acid contains heavy metals such as silver and mercury, requiring proper disposal even when the acid is “spent”. The acid works so well because as it etches down the sides of the cavity, the walls are electroplated by the heavy metals attracted to the steel. Keep the acid out of direct sunlight if stored for long periods. Same as Cronite Steel Etching Acid, but without Mercury. EH1-48R Cronite Chemical Milling Acid, 12 oz. A dark, caramel colored acid used for etching various metals. It is available in 30° and 42° Baumé densities. Recommended for use in etching machinery of all types, but it can be brushed on by hand with an acid brush. Ferric chloride is the by-product of hydrochloric acid pickling of iron usually being descaled in a steel mill. It is important that there are no silicone additives used as anti-foams in the acid. It is possible to reclaim ferric chloride, but for the engraver, we recommend only virgin engraver’s grade acid. 30°Baumé ferric chloride effectively etches brass, zinc or copper. Predominantly used for etching copper when using the powderless etching or self-banking method. 42° Baumé ferric chloride is used for etching steel. Controls foam during ferric chloride etching. Cronite supplies 30° Baumé ferric chloride with this chemical pre-added at the factory. This corrosive liquid is dark brown in color due to its main ingredient of ferric chloride. It is very effective for hand etching copper plates, and is usually applied with an acid brush. Acts faster and gives a sharper etch than straight Ferric Chloride. This acid is especially valuable for etching shaded areas. Pint bottle. This corrosion-proof instrument has a scale reading from 0° Baumé to 50° Baumé, so that it is perfect for reading and adjusting ferric chloride at 30° Baumé for etching copper using the PERI-Etching method, or at 42° Baumé for etching steel. The bristles of the brush are natural hair held in place with water-resistant glue. The handle is bamboo or plastic with no metal to rust to corrode. This inexpensive brush can be used with any acid. The brush is usually stored in water between etching sessions. White, 1/32″ thick, 3-3/4″ x 9″ absorbent pads used to remove acid from a plate after etching an area. The blotters are sold by the pound (about 50 pieces). Used for thinning Janes’ Ground and other acid resists. It can also be used as a cleaner for plates and dies. Flammable liquid. 12 oz. can. Ready-to-use, clear liquid that leaves a clear black stain on steel. It is specifically formulated for use with Cronite Transfer Wax. Poisonous liquid. 12 oz. bottle. This product leaves a beautiful black stain on copper. The concentrate is specifically formulated for use with Cronite Transfer Wax and will not cause a foulbite. An oxidizer. 2 oz. bottle. A black malleable mixture of special waxes used to transfer an image from one sheet of gelatin to another, or to a plate. This is the best wax for the purpose, and exact reproduction can be achieved. Use with Cronite metal stains and sheet gelatin. 1 oz. stick. A clear and flexible, colorless film of a special hardness that permits scratching by tools, but also resists abuse. It is used to transfer an image from one surface to another—from sketch to plate, plate to plate, or one sheet of gelatin to another. Gelatin sheets can save you time and effort when reversing or exactly duplicating images. 7″ X 17″, .006″ thick. Protectone 13A and 13B are protective chemicals used in ferric chloride for the PERI-Etch system of etching copper. The process controls the depth and sidewall etch factor. When done properly, this limits spreading of images on copper plates. Protectone 13A is a mixture of film formers plus a material which modifies the protective effects to give the required depth in line figures and coarse halftones. When in solution, the film-forming additives decompose with time and with use. The modifiers do not decompose. Protectone 13B is used to replenish the film-forming material. A starter kit is offered which has 1 jar of 13A and 3 jars of 13B. Protectone 13B is used in much larger quantities. Each is sold by the 5 lb. case of four 1-1/4 lb. jars. Add to ferric chloride when etching very fine lines and half tones into copper. Aids by increasing etch rate and smoothness of etched sidewalls and bottoms. Improves sidewall protection and helps to stabilize the bath and makes the bath last longer. In halftone baths, reduces color loss and improves sidewall slope in fine highlights. Aides by increasing etch depth and smoothness of etched sidewalls. Obtain protection when weighing and dissolving Protectone and other chemicals in this clear plastic hood. Low volume exhaust blower does not disturb your scale. It makes handling all chemicals safe and efficient. A flexible sheet of fiber cloth used for filtering out excess Protectone which may not have completely dissolved in the ferric chloride mixture during the initial bath adjustment. Reusable when rinsed, the filter media has a long life and it prevents un-dissolved Protectone from entering the bath. Without this filter, you will almost always have un-dissolved Protectone lurking in your bath causing future problems. The filter media measures 9″ x 10″ and is placed over a big funnel or colander to hold it while transferring the acid into the etching machine. The colander is to hold Filter Media which is used to pre-filter undissolved Protectone particles when adding to acid bath so no pimples occur. The electronic machine measures the amount of copper content in the ferric chloride bath. All PERI-Etch users should have one. This instrument will save you valuable time by eliminating the need to record and analyze the weight of each copper plate entering and exiting the bath. Available in either American or European electricity. Cronite modifies a standard blender with titanium blades, arbor, and hardware. The bearings are of a special space-age material for acid resistance and heat of this high speed operation. The high speed agitation will completely dissolve Protectone in seconds and eliminate any hand mixing. 110V, 60Hz power, can be transformed to 220V European voltage with transformer #YP1-169. Test targets must be used to determine the condition of the bath containing Protectone. It will aid you in determining the amount of replenishment of the additives, as well as determining if other conditions are correct. Used to accurately measure the additives for your PERI-Etch bath. This scale is capable of measuring tenths of a gram up to 2610 grams. It also encompasses a tare weight slide to make set-up time easier. Additional weight sets are available. To extend weighing range of 5-1/2# or less, and for between 5-1/2# and 14-1/2# for O’Haus Scale. Needed for accurate burn-in temperature. 400°F and 600°F are available. (Other temperatures available). Melts crayon slightly on contact. 21 step Stouffer gray scale film strip which is necessary for determining exposure time of sensitized engraving plates. A water based, safe developer for use with Safecoat II Steel. A water based developer that permits the user to develop most any aqueous photo presensitized copper, brass, magnesium, zinc, or steel – positive or negative coated – with only one high quality liquid. Ready to use, no mixing required. EP1-24W Hydrolin Universal Developer, 5 gal. EP1-24X Hydrolin Universal Developer, 55 gal. Coating remover for presensitized Conta Copper plates. CPRS #1 is more user-friendly than many other available products and is shipped as a non-hazardous product. Water soluble, no odor, re-usable. Coating remover for Cronite’s Safecoat Steel plates or Hydro-Coat Copper and magnesium, or AQ-Blue plates. CPRS #2 is low odor and non-flammable and therefore is much healthier to use than most competitive products. CPRS #2 is water based. It will also remove the epoxy coating of the back of backcoated metal plates (if left in the solution for a long time) to prepare for chrome plating. A non-etching resist remover for photo acid resists. Maxit loosens coating fast without being abrasive and no difficult rubbing is required. Flammable liquid. Used to hold soft pad material used while developing plates that require mild abrasion. Extra pads available. Photo sensitive coating primarily used for copper, brass, and steel. Developer and thinner are available. This resist is clear in color. If inspection of the exposed area is necessary, the image can be dyed with Photo Resist Dye – Blue. Flammable liquid. Photo sensitive coating primarily used for steel and magnesium. Developer and thinner are available. Flammable liquid. A solvent based acid resist, but much friendlier than the KPR’s. It is a negative working (use positive film for intaglio) resist. Use Photocrone Developer as the developer for this resist. A negative working liquid solvent developable resist (use positive film for making an intaglio plate) which can be poured, whirled, or sprayed on. Packaged in small quantity for trial or infrequent users. Solvent developer for Photo-Top Resist. Thinner for Photo-Top Resist to get proper viscosity for spraying. Dye for Photo-Top Resist so that you can see the remaining emulsion after developing. A light-sensitive polyvinyl alcohol photo resist for copper, brass, steel, and zinc. Measures level of acidity or alkalinity and determines when to neutralize solutions. Heavy duty scrubber for easy preparation of plates before coating with Vyna-Top or Kopr-Top. Includes 5″ nylon brush. Replacement brushes available. JP1-148E Casing for Plate Scrubber, replace. A specially formulated, activated, fine abrasive cleaner for preparing copper and brass plates. Non-chlorine type. High quality dragon’s blood for hand powder etching of brass, copper, and steel. For the powder etching process. Camel hair available. Wide jaws for safe gripping of hot plates. Manual pump for pumping from drums or carboys. Electric models are also available. Such as hydrometers for checking baumé, beakers, and cylinders for using the Spectronic 20. Granules for quick solidifying and neutralizing of ferric chloride and other acid spills. Sweep up the spill. Used to test the temperature and baumé of the chrome plating bath solution. The Thermometer is teflon coated and ranges from 0°F to 230°F, with 2° divisions and within 1° accuracy. The Hydrometer is not teflon coated and ranges from 0°Baumé to 15°Baumé, with 1° divisions and is single scale. Concentrated hard chrome plating solution which requires 1 to 1 addition of distilled or de-ionized water to arrive at a 12.5° Baumé bath. Sold in gallons, shipped from manufacturer. The tools used to hand cut or engrave images. Muller Gravers are available in a wide variety of shapes and sizes. If you have to reshape a graver point more than slightly suggests that you do not have enough of the proper gravers. For background work or for shading in areas, special line gravers are available. They allow the engraver to cut several uniform lines at a time and can be used for a variety of purposes. Many sizes of these are available on a special order. The gravers we supply are made of tool steel. High Speed steel gravers which are much tougher are available quickly on an as required basis. Please ask us for High Speed steel when you want the best. For more information, reference the “Engraved Stationery Handbook”. Gravers commonly employed for hand engraving dies are shown in actual sizes in the handbook. Each graver is sold individually. Inexpensive maple wood handle has a metal collar for durability. A flat is cut on one side to prevent the graver from rolling away, as well as to permit getting closer to the work. You must drill a small hole in the handle to insert your graver at your desired angle. Can be adjusted to keep the same distance from the tip of the graver to the palm of the hand as the graver is sharpened and becomes shorter. The soft tang of the graver must be bent over slightly to engage the built-in ratchet. Small chrome plated metal graver-holding fixture used to sharpen gravers quickly and accurately. Three adjustable settings let you sharpen any graver to any desired angle. Use with a sharpening stone, sold separately. A properly sharpened graver is essential to produce a good engraving. The sharpener is sturdy and will last a lifetime. Directions included. The easiest way to finely scratch through acid resist when etched lines must be marked in by hand. The diamond point also works well for tracing picture work on gelatin or for dry point or scribing work. Retractable Diamond Point is at 60o angle, set in a chrome-plated pen-like holder with a pocket clip. Retraction protects the fine point if the tool is dropped. Hardened tool steel with a precision ground point on both ends. Used for scratching metal or through an acid resist. A strong steel (old style) phonograph-type tip securely held in a pencil handle with a screw-type chuck. This is the perfect instrument for making delicate scratches on gelatin or metal. Sold as a unit. Fine instruments used for accurately spacing out lines or art work. All-metal construction with a very fine adjusting screw. They are available with 3″, 4″, and 6″ maximum distance between the points. The dividers will last a lifetime and are sold individually. Used for making regularly spaced dots on a plate for use under an acid resist for fine spacing on a pantograph. May also be used to touch up worn or damaged portions of a reverse halftone engraving or similar photoengraved plates. Small hardened steel star wheel is attached to a pencil-type handle which allows it to rotate freely. The handle is removable so the shank can be inserted in place of the diamond point in a Pantograph Machine to establish spacing marks. The size, as well as the space between the dots, is dependent on the wheel. When ordering, please specify the dots/in or submit a specimen of the dot pattern desired. Sold separately. Used to smoothly polish a particular metal surface area. Scratches, streaks, or errors on a die can be removed by burnishing. The tool is drawn back and forth across the surface with long, even strokes at right angles to the burnisher’s length. A clean, thin oil will help to lubricate this action as the metal is smeared or pushed around by the tip. We offer straight and curved Burnishers. Every engraver should have both shapes, but the straight burnisher is normally preferred since it has two usable sides. Made of hardened and polished tool steel, they will last a lifetime with proper use. The T Square is used for laying out work on dies or plates. We manufacture fixed head and swivel head models. Both have low profiles to clear a 1/2″ die height, but the swivel head model has a low enough profile on the swivel side to be able to clear a 1/16″ thick plate. With the Swivel Head T-Square, a layout can be made at any angle. Each model has a brass head and an 8″ spring steel leg This is definitely a required tool for an engraver. Used for precisely scraping metal from surfaces. Hardened steel, triangular blade has three sharp edges coming together to form a point. For use in an engraving machine or pantograph, the tracing point is attached in the hand piece of the tracing arm. The operator places the Tracing Point in the groove of a Masterplate’s character so that it may be traced accurately. The sharp tip is concentric to the outside of the point’s body, so the character will not become distorted if the operator rotates the hand piece. Tracing Points are made of hardened tool steel and a good assortment of differently rounded tips are required to fit differently worn Masterplates. Sold individually or by the dozen. The 3/16″ diameter by 2-7/8″ long Engraving Machine Diamond Point scratches through acid resist which has been applied to a die prior to etching the image. The Diamond Points are ground to a perfect conical point at a 60o included angle. Care must be taken not to lower the point onto the die too rapidly, or the Diamond Point may fracture. Sold individually. If a point is chipped, it can sometimes be re-sharpened, but approximately 1 out of 3 points that are being re-sharpened fail because too much of the stone’s setting is removed in the process. Durable, non-adhesive 1/2″ wide paper tape, made specifically for use with all pantograph engraving machines. Used to mark off the space each character occupies, so that each letter in a word or phrase is accurately spaced on a plate to be etched. Sold in individual rolls or by the dozen. Most Masterplates have an alphabet pattern etched into them. The guide lines permit a pantograph machine’s tracing point to make properly spaced words. Made of tool steel 3-3/8″ wide, 19″ long, and .050″ thick. Masterplates are chrome plated to add to their longevity and rust prevention. Over 330 letter styles are available. These can be seen in the Engraver’s Letter Styles Booklet sold as Part No. EB1-203 and ordered by their part number. 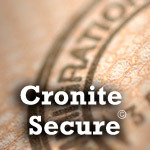 Cronite has a large inventory of used masterplates available. Please contact us for further information. Cronite offers a variety of Monogram Masterplates for use on pantograph machines. One of the most popular styles is the Fangman, a 3-letter monogram set placed on 4 Masterplates. All other styles are arranged on single plates. Request a sample sheet showing the different styles available. Thin plates made of either .050″ thick steel, .064″ thick zinc, or .032″ thick celluloid, which measure approximately 3-3/8″ X 18″. The Blanks are used for making your own Masterplates, which can be used in a Zero Engraving Machine. Steel Masterplate Blanks wear best for most purposes. Zinc is better in some cases because it is easy to hand cut and wears acceptably. Celluloid can be cut very easily and will withstand several dozen tracings if care is used. They are clear, with one side frosted and the other side smooth. Making a Celluloid Masterplate is quick and easy. The engraver traces a forward image on the frosted side with a lead pencil, then turns over the blank to hand engrave the image using the tracing from the other side as a guide. Each plate is sold individually. Emery is a natural composite of corundum and iron oxide. The particles are cubical and tend to produce a polishing action while material is being abraded. Although the fine Emery Cloth has a grit value of 150, it cuts relatively quickly, while leaving a smooth polished surface. Grit values available are fine and medium in 9-1/2″ X 11″ sheets. Sold in individual sheets or by the dozen. These very fine papers are primarily used on copper. Grit values offered from, fine to coarse, are: #0000, #000, #00, #0, and #1. A coarse grit 1 is still very smooth. Sheet size is 9″ X 13-3/4″. Sold in individual sheets or by the dozen. A premium, precision abrasive for producing a fine finish on your copper and steel plates. 1000 grit on a polyester backing. Lasts longer than emery cloth. Sheet size is 8-1/2 X 11. Our specially selected grade of willow charcoal is a fine abrasive, chemically treated for use on copper. It will not put deep scratches on your plates. With the charcoal held vertically, rub the end of the grain against the metal. Lubricate with kerosene or gasoline mixed with a little oil. Store the charcoal in that same oily mixture in a covered jar so the charcoal will soak up the lubricant. Sold in individual sticks approximately 1-1/8″ X 1-1/8″ X 3-1/2″. Aluminum oxide stone produces a smooth cutting edge on gravers. Double-sided with a coarse and fine side. Use with a light oil to help prevent clogging the stone’s pores. Measures 2″ X 6″ X 1″ thick. Used primarily on copper to reduce high spots, off-white stone is manufactured from compressed pumice. More abrasive than the Scotch Stone. Use water as a lubricant. Measures 5/16″ X 5/16″ X 5-1/2″. The most effective stone you can use to remove large amounts of metal. The stone is generally moved back and forth on steel to remove high spots. Any scratches left from the stone can be removed easily with Emery Cloth. Thin oil or kerosene should be used to aid in cutting. Gray in color; measures 9/16″ X 9/16″ X 4″. 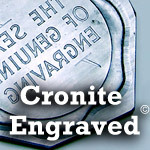 Cronite supplies many thicknesses of Engraver’s Steel. This aircraft quality, electric furnace steel is specifically formulated to our exact specifications for ease of hand engraving and evenness of etching. At the same time, it is very tough, in order to hold up under the pressure of wiping and stamping. The steel is ground sufficiently to get below the surface of pits and inclusions, and then polished to a smooth working surface which can still hold an acid resist. Except for photo-presensitized material, each piece is then coated with a film of anti-rust compound and wrapped in wax paper for protection. 1/2″ thick Steel is available in 25″ long bars or in dies cut to desired lengths from available bar widths. The available widths in inches are 3/4, 1, 1-1/4, 1-1/2, 1-3/4, 2, 2-1/4, 2-1/2, 2-3/4, 3, 3-1/4, 3-1/2, 3-3/4, 4, 4-1/2, 5, 5-1/2, 6, 7, and 8. Sold by the square inch. Available in 24″ long strips or in plates cut to the size you specify. Maximum width is 10″. A specially formulated steel with a higher carbon content. The steel can accept transferring from transfer rolls and hardens more thoroughly than Cronite’s 1/4″ Engraver’s Steel. Maximum size available is 20″ X 25″. The grain direction should be specified when ordering. If desired, the edges can be beveled as required for some printing machinery. Sheets measure 12″ X 25″ and are coated with an anti-rust compound. Also available in 25″ long strips, or in plates cut to the size you specify. Edges are deburred. Quantity price discounts apply at 25 and 100 sheets. Cronite supplies 4 types of engraver’s grade copper, in 16 gauge (.060″ or 1.5mm thick). It is the highest quality silver-bearing material available and is always flawless. Coated with a negative-working resist which is protected by a light-blocking plastic masking sheet. This presensitized copper works with a positive film. It offers the distinct advantage of a very smooth surface beneath the presensitized coating for perfectly photoengraved fine lines and delicate screens. Because the copper uses a solvent developer, shelf life is much longer than that of material that uses water-based developers. Has an enamel backcoating. Sold in 16″ X 20″ sheets or cut into plates of the size you specify. Quantity price discounts apply at 11 and 25 sheets. Only complete sheets are sold and then cut to your size requirements. Very smooth, dull finish (not brushed), that is non-reflective. Excellent for applying acid resists or other coatings since it has just the right surface texture and needs no additional preparation. Has an enamel backcoating. Sold in 18″ X 36″ sheets or cut into plates of the size you specify. Quantity price discounts apply at 11 and 25 sheets. Presensitized positive working resist coated copper preferred by the photo engraver making embossing or intaglio plates while using negative film. Available in many thicknesses, 16 gauge, 3mm, 1/4″, 7mm, and different sheet sizes. Use with Contalin Developer. A .020″ thick (1/2mm) double-sided photo presensitized negative-working plate for pad printing machines. This very tough, high quality spring steel offers a resistance of 240,000 pounds per square inch. Special surface treatment permits excellent printing results for up to 50,000 impressions per side. Uses a solvent-based, clear developer specifically formulated for Photocrone Steel. (Materials using a solvent-based developer usually have greater shelf life than water-developable materials, because humidity will not develop them.) Processing instructions are available. Sold by the sheet only, and with quantity discounts at 25, 50, and 100.